New York native Amanda Serrano made an enormous splash at the Theater at Madison Square Garden Friday night as she won her 7th – that’s 7th – world title in stunning fashion, stopping Eva Voraberger within seconds of the first round of their title bout with a tremendous body shot. By besting Austria’s 24-5 Voraburger within 35 seconds, the 36-1-1 Serrano earned herself the WBO super flyweight title. A high profile bout with the undefeated Katie Taylor may be in Serrano’s future. Chris Algieri stepped into the ring next to face former sparring partner Daniel Gonzalez. 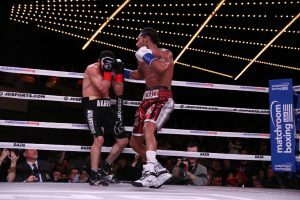 Since New York’s Algieri was essentially fighting on his home turf, it was easy to consider the match not much more than a tuneup walking in. Gonzalez held his own, however. What’s more, the 23-3 Algieri looked like, at 34, he had aged a bit. Ultimately, it didn’t matter. Algieri earned a unanimous decision win against the 17-1-1 Gonzalez. Surprisingly, some in the crowd booed at the decision. Next up was Irish/Australian IBF junior featherweight champ, the 20-0 TJ Doheny. His opponent was the 16-3-1 Ryohei Takahashi of Japan. Takahashi took the fight on a few weeks notice, and looked outclassed by his stronger, sharper punching foe. In the third, Doheny sent his man to the mat. Takahashi got up, but Doheny continued to land powerfully and essentially dominated. Referee Michael Ortega stopped the fight in the twelfth while Takahashi was receiving punishment. In the co-main, Jorge Linares, 45-4, fought Pablo Cesar Cano, 31-7-1, in a scheduled 12 round super lightweight affair. A Cano right hand took Linares down in the first. Linares got up – and then went down again later in the round. He went down once more, got up once more, and took more punishment. The referee wisely stopped the fight. It was a stunning upset and a brief, brilliant performance from an impressive ring veteran. It was time for the main event. The 26-0 Demetrius Andrade stepped into the ring to defend his WBO middleweight title against the 19-2 Artur Akavov. Andrade looked like his athletic, sharp self in the first, dominating the tempo and landing effectively. The second round was a close affair, though Andrade seemed to have edged it. The third round was close, as well, with Akavov catching Andrade with a quick uppercut. Andrade came around at the very end of the fourth, but it was proving to be a close fight, with Andrade’s skill and Akavov’s awkwardness playing well off one another. Andrade’s jab told the story in the fifth, as it was becoming clear that Akavov couldn’t land cleanly or often on his man. The sixth saw Akavov unable to get in range. By the seventh, things had become completely one sided, with Akavov simply looking outclassed and perhaps a bit wiped out. Andrade continued his pattern of hitting and not getting hit in the eighth. Akavov actually had a few moments in the ninth where he looked to be starting to dominate. Andrade, however, was able to keep his range. Akavov did so little in the tenth, that one had to wonder if he’d actually make the final bell. The eleventh was more target practice for Andrade, who seemed to want to stop his helpless foe, but simply may not have had the power to at middleweight. However, with Andrade banging away at his man, the fight was stopped by the referee late in the twelfth. The fans and the DAZN broadcast team seemed unhappy and perplexed, but referee Arthur Mercante was clearly willing to err on the side of caution.